Arnold Palmer once remarked on the game which made him a legend thusly: “Golf is deceptively simple and endlessly complicated.” Anyone that has ever picked up a club and played a few holes knows that Palmer was making an understatement. The basics of golf are fairly straightforward and easy to learn, and many develop a passion for the sport after just a few weekend games. On the other hand, becoming a truly skilled golfer is a much more difficult achievement. The good news for hopeful amateurs though is that becoming a great golfer is not beyond the reach of most players. The five sets of practice drills, helpful tips, and practical information will see you on your way to hitting on or below par with every new round far sooner than you may have thought possible. If you plan on improving your golf game, obviously you are going to have to start hitting some balls around for practice. The more hours you invest off the fairway in perfecting your technique and style of play, the more you will get out of each game. However, directionless practice that doesn’t work towards a goal means more effort and less results. Most golf pros hold to the idea that there are four laws of useful practice, and learning to use each of them in your training regimen will take a lot of frustration and anger out of the process. Even on days when it seems like you can’t get the hang of anything for love or money, there is a rhythmic flow of practice that you can tap into that will give you consistent results towards improving your play. Log enough effective practice hours, and you will get where you want to go before long. The first law of useful practice is an easy enough concept to grasp: your practice needs to be tailored to your weaknesses and strengths as a player. That seems to be more common sense than some mystical secret art of golf, but just like the sport itself, the actual application is infinitely more complex. When you personalize your practice, you take yourself outside your comfort zone. A golf coach or teacher can be invaluable during the early phases of personalizing your golf practice, helping you to assess and evaluate where you need to apply the most effort to improve. It’s not a requisite for better play, but it certainly helps. The most important thing to change is to think differently about scenarios of play on the fairway and the green that make you uncomfortable or anxious in terms of your ability to make the strokes and moves necessary to shave those extra strokes off of your game. Rather than avoid the situations, an excellent way to practice is to deliberately put yourself in those situations to increase your overall comfort level when confronted by them. As you play more under those uncomfortable conditions, you will become more familiar with methods of overcoming those perceived obstacles and difficulties, and your practice is actually allowing you to achieve a measurable result as your comfort level rises. As with many sports and situations in life, a strong golf game is all about well-founded self-confidence in all circumstances. The point of effective practice is to push beyond your current limitations in your golf game in order to establish new boundaries that will in time be pushed back as well. It doesn’t mean seeking to the impossible with every session though, but rather means taking what you know you can do and using that competence as the foundation for supporting your efforts as you make forays into activities and situations that are outside your player comfort zone. Set a small but achievable goal that is just a bit more difficult than you are used to, then use that to build on as you get more confident with your process. The difficulty that most people fall into with this is fear of failure. It can definitely be a whole lot of less-than-thrilling work to focus on skills that you have traditionally struggled to find successful performance with while playing. Experts agree, however, that the time you spend pushing your comfort zone and the limits of what you think you can do are the most surefire way to see your game improve. The choice is yours: you can keep avoiding strokes and environments that you know you have not historically held great success for your, or you can face those challenges and become a better player. Take the time you need to play your best, even when it feels like a chore. No one ever improves without hard work at their weakest skills. Accept that you may fail, and do it anyway. You may be surprised at how well you actually do. Muscle memory developed through practice is going to make you a better player. If you don’t repeatedly try to overcome those barriers and obstacles that hold you back as a player, then you aren’t going to improve. No professional athlete of any significant skill has ever achieved their success and skill overnight. They spend countless hours, days, weeks, months, and years repeating the same action as perfectly as possible over and over again. This trains the brain to lock in that muscle memory and coordinate bodily movements to become consistent in the proper execution of a skill. Don’t focus on the number of overall repetitions either, but instead focus on executing each practice stroke or movement perfectly. One hundred perfect strokes is far more effective in improving your golf game than one hundred thousand strokes with poor form. The final piece of advice for deliberate, personalized practice is feedback. There are a number of ways to do this, though the easiest and most effective is through a skilled golf teacher. They have the experience and expert eye to help you cut out bad form habits and develop proper ones consistently. This can be quite expensive though, so another alternative is recording a video of your practice sessions and then seeing how your form is affecting your practice, and what you need to do differently. When you put forth your maximum effort to strengthen your weaknesses, you will excel at achieving and surpassing your goals. Personalized practice is an exceptionally effective means to combining your maximum effort with the best techniques, and sometimes it makes all the difference between success and failure. By the same token, practicing the same skill endlessly until you can perform it perfectly isn’t necessarily the best strategy either. Change things up now and then, and try various clubs and drivers to make sure you are prepared for any and every scenario and circumstance. Randomizing your practice schedule may also help you shake things up a bit if you start to get stuck in a rut, and it also helps your brain keep up with your development of new skills as you retrain your muscles for proper form and technique. Lastly, when you find yourself getting a little too sloppy or slack when working with a particular club or type of shot, it’s time to start incorporating that into your practice sessions. Keep trying new things. Let your brain figure out some new creative solutions to problems. Training is always a good idea, but training holistically in both mind and body is going to be what helps you achieve your long term goals. Understanding how to practice is just the first step: knowing what to practice is the hard part. Every golfer struggles with a different area of weakness, but there are a basic few skills on the course that can improve anyone’s golf game with a little focused practice. One common problem for many beginners is overcoming their fear of putting. It is obviously a fundamental part of the game, but many players really struggle to master their putting. Fortunately, there is a wealth of good advice from numerous experts that can help anyone overcome their shortcomings in their putting game. Here are a few drills to help you start developing your own art of the putt. This is an often neglected putting skill that that many golfers could benefit from practicing more often. While your short game is important too, it shouldn’t be the only technique that you practice. Putts over twenty feet are often the most problematic scoring scenarios for many golfers, but there is a very easy and fun way to strain your muscle memory for those long shots on the green. The goal of this drill is putt from a longer distance with the goal of making a two stroke putt. One stroke is obviously better, but remember what we learned about setting small, achievable goals. Stroke one should be all about getting close to the hole to set yourself up for stroke two’s easy knock-in. Now that you know what your goal is, you need to understand the drill’s scoring system. Obviously, if you can’t win at something with your practice you aren’t going to be as motivated to do it, and it’s easier to track your performance from day to day. When you putt from a distance greater than twenty feet and make it in the hole, give yourself three points. If you miss the putt, but the ball is within a 3 foot radius of the hole, you get one point. You are going to have to make a lot of one point shots before you master that three point shot though, so if you have a rough couple of practice sessions every now and then, don’t sweat it. Real progress takes time, effort, and a lot of failure before you can succeed. Play on the green tends to psych a lot of players out, and it is where even the best players can start to fumble their stroke. After all, once you are on the green, there is a great deal more pressure. The Clock Drill is an excellent technique for learning to get yourself accustomed to dealing with pressure on the green so it has far less of an impact on your play. Get on the putting green, and set up a target such as a cup, and drop four golf balls. It doesn’t matter where you place them in relation to the cup, but they need to be the same distance from your target. Next, try to sink all four shots. Once you have all four shots in, move your starting position back a foot or two, and then start shooting again. If you miss, you go back to your original distance and start over. This is an excellent way to recreate that feeling of pressure on the green in order to help you stay cool and improve your putting game during an actual game. See how far back you can go without missing a shot, make a note of it and then try for greater distance next time. Practicing your putting game using this technique can be done just about anywhere you have a flat surface for your ball to roll on. All you need is a coin, a golf ball, and a putter. Your goal is to putt the ball over the coin on the ground. This requires a higher degree of accuracy, and will help you set and achieve some stretch goals for your putting game. More often than not, you are going to miss, or the ball will strike the edge of the coin but will not roll over it. The chief benefit of this drill is that you can easily track your improvement while helping you master the skill of striking the ball in the middle of the putter face, which is absolutely invaluable when making shots on the green during regular play. can throw off your shot, so you will need to practice shooting from multiple positions on the green in different types of terrain to learn how each affects your shots. Learning to read the green can make all the difference between winning and losing during an important, so don’t neglect your reading and shooting skills. Improving your iron shots involves proper implementation of many skills and techniques. You are going to need to practice striking the ball correctly to shape each shot’s trajectory, and learn how to best align yourself and the ball before making the shot. There are countless ways to accomplish both tasks, and you will want to play around with as many as you can to find the techniques that work best for you when it comes to improving your iron game. One common mistake a plot of players allow to affect their play is to attempt to lift the ball through the shot. This is a misguided error, because if your dominant hand comes under the contrary too fast, you end up creating a scoping motion. Whatever you do, don’t scoop your shots: scooping lacks accuracy and distance, both of which do nothing for you in terms of optimal play. Try to practice striking with a slightly descending blow instead to avoid that all-too-easy to fall into scooping motion. On the downswing, shift your weight onto your front leg while keeping your leg and shoulder directly on top of one another. Use half swings to practice getting the back of the non-dominant hand aimed at your target so that your shot is already lined up when you make contact with the ball. ​Maintain your hold on the club with the bottom three fingers of your non-dominant hand. ​Your dominant hand needs to rest lightly on the club so it doesn’t press against the non-dominant hand, which causes the club to flip upward. ​On contact with the ball, the non-dominant hand should roll closed with the dominant hand on top. Repeat these movements as needed until you have them in your muscle memory. Additionally, posture has a significant impact on your irons keeping your position consistent throughout your swing. To improve shot posture, keep your right arm straight on the takeaway to create a shoulder turn rathern than lifting your arms, Push off with your right foot and hold your weight to the left, turning your hips through the shot and making room for your arms to swing into the impact. Practice these movements with whatever adjustments are necessary, and you will soon see your iron swings start improving. Other experts offer ten simple rules for sticking your irons, and many players find that certain rules are more helpful than others when it comes to improving play, but all of them will definitely benefit your overall iron game. 1. Speed is not the most important part of your swing, but being smooth is. Being able to swing at roughly 75% is your sweet spot for irons, as anything more than that throws off your balance and rhythm. Practice it a few times and see if it doesn’t help you land your shots more frequently. 2.. Know your gear and be aware of the proper striking point for each iron. The sweet spot is actually below the center of the face, something that many players do not know. Practice with all of your clubs to see what minor adjustments affect how and where each shot goes. 3. Create a mental image of the club as it impacts the ball. Visualization is key to good follow through, keep that picture in your mind as you swing and keep trying to come as close to that mental image as possible with each stroke. 4. Don’t sweat the small stuff. Alignment, rhythm, and contact are all you need to concern yourself with on each shot. If you can’t calculate something, forget about it and calculate what you can. It’s a lot better for your mental health. 5. 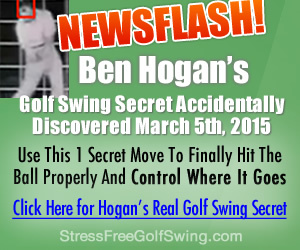 Want to make those slamming iron shots? Keep the angle in your dominant wrist, and end the stroke with that palm facing down. Many players find that this stroke feels much more natural than they thought at first glance. 6. Leaning your club forward and toward the target is key to maintaining good posture during a shot. Don’t let your body create a swing disaster, and pay attention to both your posture and club position during your swing. 7. While distance and direct of a shot both matter, distance is more important for beginners. If you focus on hitting the desired distance, the accuracy will come with time. Focus on one thing at a time, and start with distance control. 8. Watch and listen to your shots. The sound of impact tells you a lot about each stroke and how well executed it was, and that can teach you a lot about your iron game and help you make improvements every time. 9. Don’t swap gear based on one shot, especially in a demo situation. Always try out new irons on the course and see how they work for your before you assume they will work well at every other course you play. 10. Practice matters, but playing is important, too. Get a game together with a few friends and try out some things you’ve been practicing on your own. The more you play, the more improvement you will see. Chip shots are strokes played within just a few yards of the green where the object is to loft the ball into the air in a tight arc in order to land it on the putting surface and allow it to roll toward the hole. Most players choose anything from a #5 iron to a sand wedge to put the ball on the green as close to the pin as they can. Mastering chip shots is key to making significant gains in your average score, but even many seasoned golfers ignore this fundamental skill for shaving strokes off your game and getting more out of every round. There are numerous chipping techniques, but we will just highlight the ones that have proven most effective for beginning golfers. Begin each chip shot by thinking about exactly where you want the ball to land. Obviously, you want it on the green, but what part of the green is going to provide you with the best putting position for your next stroke? Golf balls bounce much better on the green than they do in the rough, so keep that in mind for when it lands. Also, avoid landings on slopes or uneven sections of the green since that makes its final stop harder to establish. All you have to do once you’ve picked your spot is visualize the perfect shot and landing and try to be as precise as you can when you make that swing. Some clubs are superior to others depending on the situation for making a chip shot. The closer you are to the hole, the more loft you want compared to power. If you are farther away, choose a club with a straighter face. Sand wedges are great for short distances, but if you are going for loft and distance, a #7 or #5 iron is the superior choice. Make sure you are paying attention to where you are, where you are aiming, and what options you have in your bag before making your chip shot. Feel free to experiment too, as some club choices may surprise you. Positioning yourself correctly in relation to the ball and make sure you make solid contact during the stroke. Keep your shoulders open towards your target and rest your weight on your non-dominant side. Move your hands ahead of the ball with a downward strike to make the most effective contact with the ball. Focus primarily on your non-dominant wrist, keeping it flat and firm. If you have trouble maintaining the proper off-hand position, try taping a pen or similar to the back of your wrist. You will know right away if you are implementing the technique correctly, and once you’ve established the correct muscle memory you can just remove the pen and have a much cleaner chip stroke. After hours of putting, iron practice, and making chip shot after chip shot in practice, you will start to see improvements in your regular golf play provided you are getting proper practice. What’s next? Don’t stop practicing. It is easy to give yourself too much of a break when you feel like you are getting somewhere, but that’s when you will notice your skills starting to slip again. Recognizing progress is good, but building on that progress to try harder and improve more is better. Don’t forget the most important part of all though: play the game. You will have a harder time seeing progress if all you do is practice and never just play the game for fun. Remember why you took up golf in the first place, and make sure that you get out on the course with friends regularly. The more unusual situations you play through and the more challenges you overcome,the more your practice will show its worth. That’s all the advice we have for you for now. Go an play a few holes with your friends.